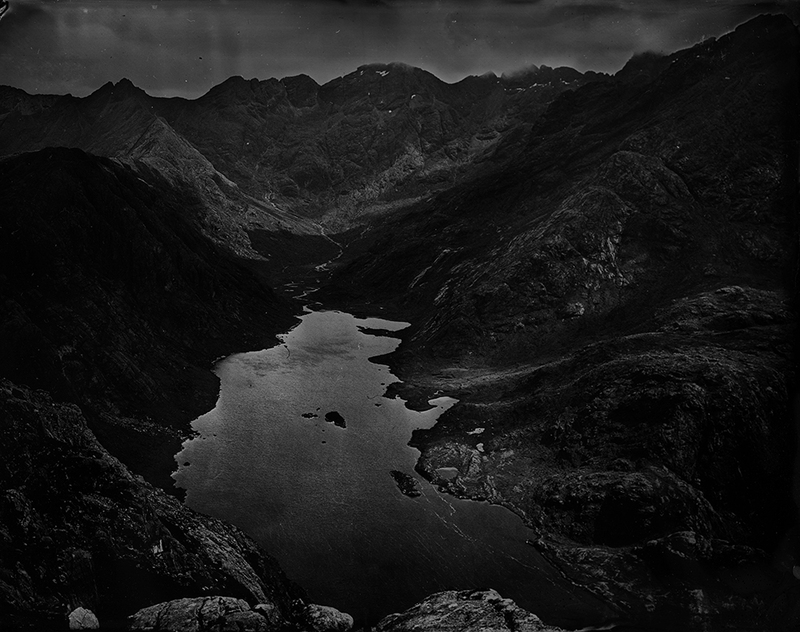 It's hard to pinpoint the exact moment when I decided to strap an ancient field camera to my back, as well as an entire darkroom and tent to develop my images, and begin the often long climbs to the peaks and summit ridges of Scottish mountains. Perhaps it was my upbringing in a strict military family that valued both determination and a focus on overcoming all obstacles, or something in the ether in my rucksack. Either way, it's a question I've often contemplated on the arduous and back-breaking journeys upward. 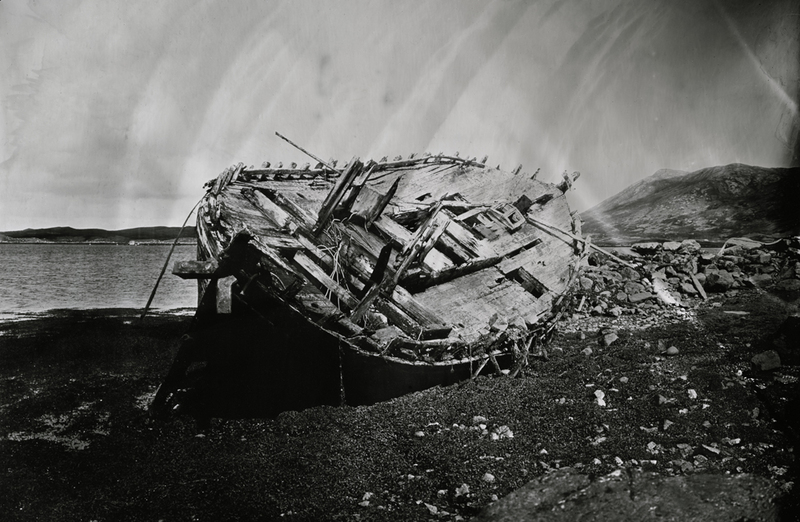 In younger days I admired the work of the explorer photographers such as Herbert Ponting, who accompanied Captain Scott on his polar expeditions. In more recent times I've been drawn to the work of Thomas Joshua Cooper, who makes similar journeys to places that see few visitors. I however was interested in a more personal journey: to see if, at the point of exhaustion, I could still make images with trembling hands; to have my mind cleared of external influences; to focus completely on the task of recording what I experienced. In my mid-twenties I worked mainly on commissions, and a series called 'Sonnets' with the late Scots Makar Edwin Morgan, which for a while took over my life. On his death in 2010 I decided to end the series. To gain some distance, I looked into new ways of making images. In my case, however, this would involve using a photographic process from the 1850s. The method behind wet-plate collodion is complex. It requires the photographer to make images by pouring collodion, a thick, sweet-smelling chemical, onto pieces of tin or glass. These are dipped into a bath of silver, then loaded into the back of an old field camera. After pointing the camera at the subject and making an exposure, the image is opened in a dark-place, developed, and then fixed, often using cyanide. From start to finish you have only 10 minutes to make and develop the image, hence the name wet-plate. Once the chemicals dry, the image is unworkable, which is why I need to carry a darkroom with me. In the confines of a studio it is actually much easier than it sounds, and becomes second nature to the experienced photographer. Doing it on the side of a mountain, or in an exposed landscape while being attacked by the local insect population, the wild weather, or both, is much more challenging. Having learned the basics of the Black Arts at workshops in the UK, I was lucky enough to receive a Winston Churchill Fellowship, and spent time in the US learning first-hand how to make images outdoors. In California I learned how to work in the landscape from masters of the craft such as Luther Gerlach and Joni Sternbach. I travelled east to the snowy landscapes of New York State to meet Scully & Osterman, widely regarded as the couple who kick-started the contemporary obsession with making photographs using antique processes, and who taught photographic legend Sally Mann how to make some of her most stunning and personal work. Feeling inspired, I returned to Europe, beginning a period of intensive training, photographically, physically and mentally, to make images in a more focused way. Once, on a towering Atlantic cliff-edge in Ireland, I almost came undone. The exhaustion and chemicals had taken their toll, and I made the error of falling onto a ledge below. A few days later, having recovered from my injuries, I set back to work with a new sense of clarity and purpose, and began to make images that took me to the edge, but not over it. Working in this way allows me to explore an aesthetic which often creates brooding images. If I want to make the landscapes more abstract, or to create dramatic blackened skies, my hands will work quickly to burn the images with chemicals. Each is a reflection of my mood, the unpredictability of the chemicals. This approach would likely make the Victorian photographers who used the process recoil in horror. On my return to Scotland I received a commission and residency with the Royal Scottish Academy to work at Sabhal Mòr Ostaig on the Isle of Skye, which gave me the opportunity to spend time in the Hebridean landscape making work. Since then the project has grown. I've taken my cameras and chemicals across the Outer Hebrides, Orkney, to the peaks of the Cuillin Mountains, through Glencoe, and to the remarkable landscapes of Assynt. The work takes its toll. My body carries the scars of making images in such a way, from the collapses and falls, to the black stains on my hand from silver nitrate. I don't regret any of it for a minute. The moment I realise I've made an image that works is one of euphoria. It makes it all feel worth it. 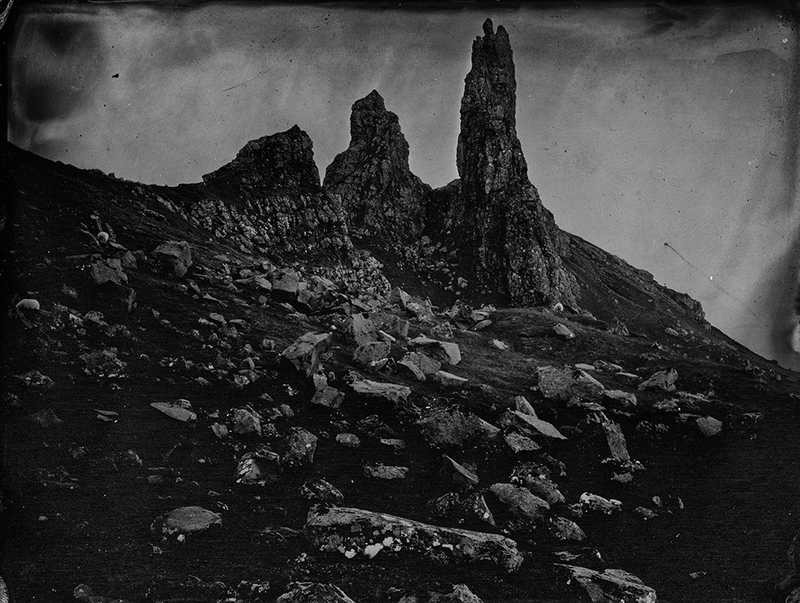 An exhibition of new work by Alex Boyd is on display at the John Muir Gallery in Pitlochry until September 1st. 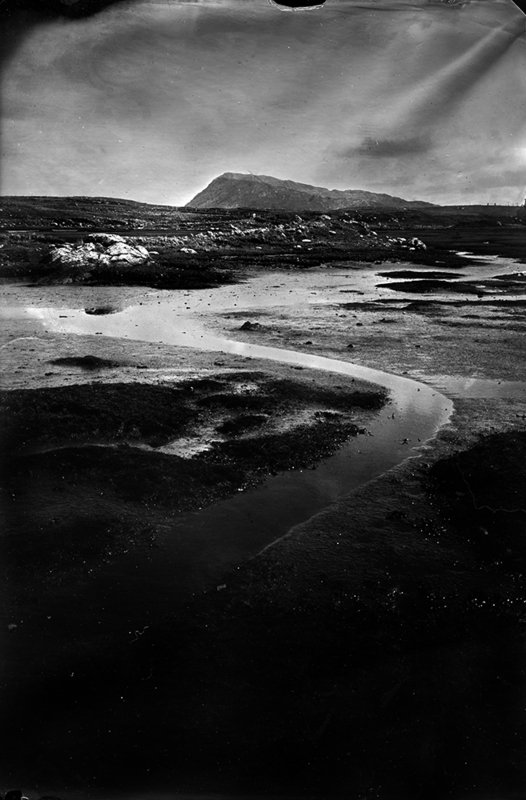 Alex Boyd is a photographer and curator based in the Outer Hebrides of Scotland. Educated at the University of Glasgow, his work has been widely shown internationally with solo exhibitions at the Scottish Parliament, as well as group exhibitions at the Royal Academy, Royal Ulster Academy and Royal Scottish Academy. He is best known for his collaboration 'Sonnets' with Scots Makar Edwin Morgan. In 2012 he was made a Fellow of the Royal Society of Art (FRSA). In 2013 he was Artist in Residence at Sabhal Mòr Ostaig on the Isle of Skye. He has been celebrated for his contributions to Scottish culture several times by the Scottish Parliament, both as an artist and a curator, and his work is held in the collections of the National Galleries of Scotland, the Royal Photographic Society, the RSA, and the Yale Centre for British Art in the US. His first book 'St Kilda - The Silent Islands' will be released in November 2016.